Looking for an easy, convenient and space-saving way to turn your office, hotel room or bedroom into a gym? 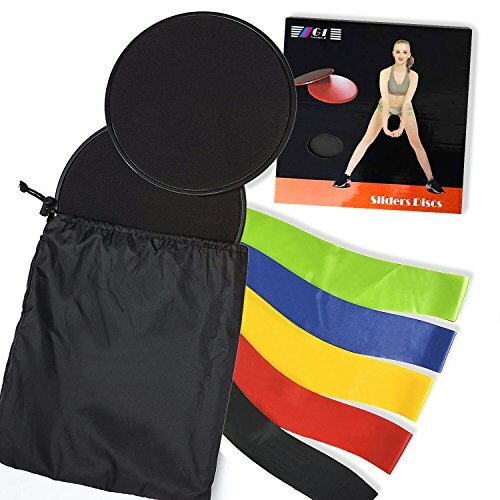 Our space-saving and affordable home gym resistance loops and fitness slider discs kit are designed for people who don't have much free time or space and want to squeeze in a workout during lunch break or while being on a business trip! Are you bored of your workout routine and searching to mix up your exercises? This amazing set of 2 core sliders and 5 non-slipping resistance bands will upgrade your fitness equipment immediately and adds variety and intensity to your workout. Targeting various Muscle groups, Including your abdominal, Glutes, legs and more, Core disc sliders provide a low impact workout, which will aid in weight loss Combined with the resistance bands, you will be on your way to a better you! If you have any questions about this product by Evanto, contact us by completing and submitting the form below. If you are looking for a specif part number, please include it with your message.